Wikipedia defines “eminent domain” as a power of the government “to take private property for public use.” In the United States, the Fifth Amendment of the Constitution modifies this power, requiring that the government provide “just compensation” if it takes property via eminent domain, which aims to strike a balance. On one hand, if the government is trying to build, say, a new highway, it’d be pretty bad if a single landlord could prevent that from happening. That said, we don’t want the government to be able to just grab property willy-nilly — there should be a legitimate reason for it, and the public should have to pay a fair price for it. That image — known as the Hess Triangle — is a roughly 500 square inch (0.32 m^2) mosaic on the corner of Seventh Avenue and Christopher Street in Manhattan’s West Village. (Here’s a satellite map — you can vaguely make out the Triangle on the corner near Village Cigars.) It dates back to the 1910s, when the city wished to widen Seventh Avenue in order to build a subway line. A man named David Hess owned a five-story apartment building known as the Voorhis, and unfortunately for him, the Voorhis was situated in the demolition zone. The city used its eminent domain powers to acquire the land, which Hess fought unsuccessfully. By 1914, the Voorhis was no more. But according to Wikipedia, the city’s survey of the area taken via eminent domain didn’t quite jibe with what the city told Hess it took. 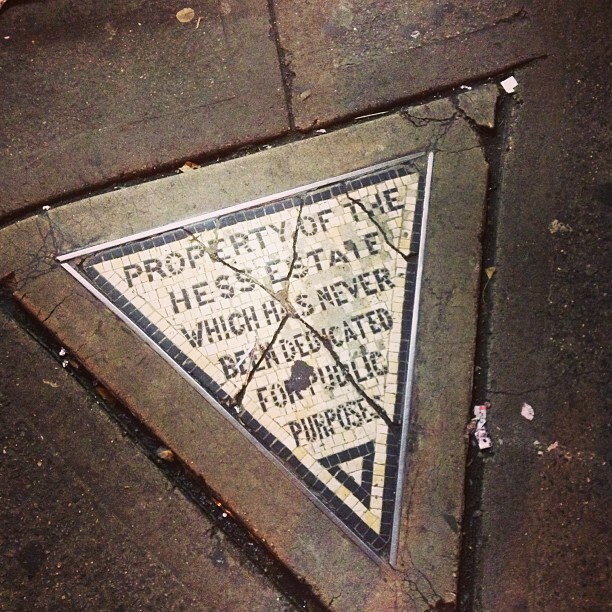 A small triangle of land — a very small triangle — was still property of Hess, and Hess and his family reclaimed it. In 1922, the government asked Hess to donate the land to the city, but he declined. Instead, he had the mosaic above installed, protesting eminent domain by stating that it was “Property of the Hess Estate Which Has Never Been Dedicated For Public Purposes.” And his heirs kept true to that protest. As of 1930 at least, the Hess estate was still paying the Triangle’s hopefully minute property tax bill. The Hess estate’s protest has withstood the test of time. It was acquired by Village Cigars, the store on the same corner, in 1938 for $1,000 — that’s a bit more than $16,000 in today’s dollars — and remains in front of the store to this day. Of course, for all intents and purposes, the Triangle is very much public — people walk over it all day long, without fear of being called trespassers. But when they do, the mosaic is there to remind them of Hess’ battle a century earlier. Bonus Fact: In the late 1990s, Pfizer — the multinational pharmaceutical company — struck a deal with the city of New London, Connecticut, to develop the area known as Fort Trumbull. Fort Trumbull was already located near Pfizer’s plant in the town, making the corporation a reasonable backer of any improvements, but there was one problem: a handful of people already lived there. The city created the “New London Development Company” (NLDC) which was empowered to negotiate with these landowners to obtain their land. When many declined to sell, the city turned to eminent domain; the owners in turn, sued, claiming that the NLDC wasn’t acquiring the land for public use, but rather to further private interests. In 2005, the Supreme Court ruled against the homeowners, allowing the NLDC to acquire the land. (The decision proved controversial; in subsequent years, 44 of the 50 U.S. states have passed legislation to restrict their own towns’ power in similar situations.) The houses were bulldozed shortly thereafter — but the land was never developed. Pfizer left the area in 2009 and the city couldn’t obtain funding to develop the Fort Trumbull area; as of March 2014, the land is vacant. In recent weeks, though, New London has found a use for the open land — it is dumping lots and lots of snow there. From the Archives: Road Rage: The story of the Toynbee Tiles, mosaics found in New York City — and many, many other places. Related: Eminent Domain, the board game. 4.3 stars on 33 reviews, and generally well-received on BoardGameGeek.com.